For a long time, the day you actually woke up early enough to get McDonald's breakfast was better than payday. Now that it's served all day, some of that shine has worn off, but those memories mean it still holds a special place in our hearts. There's a new item coming to breakfast, though, and it honestly might be as exciting as actually waking up on time used to be. 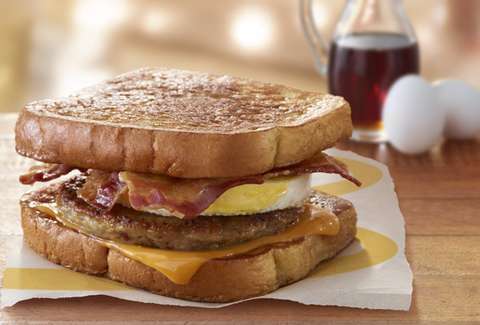 It's called the "McGriddles French Toast sandwich." As you've probably deduced, this new sandwich is a twist on the McGriddle, but instead of using pancakes for a bun, it features French toast. It's an innovation so simple that in retrospect seems obvious. But if it was obvious, why didn't you think of it? The brioche French toast will be sandwiching "a grade-A freshly cracked egg, melted American cheese, savory hot sausage, thick cut Applewood smoked bacon and brushed with sweet syrup." These are all good things. Unfortunately, this monster is only available at a little over 200 locations in Minnesota right now. But if the response is positive, it should be coming to the rest of us.